Honestly very disappointing. Even though it is a small work by comparison to some of his other works, I still expected that usual depth of scholarship and ability to surprise you with a turn of phrase or well thought out question. One of Tom Wright’s rare gifts in writing is the ability to make you unsure of whether you agree with him or not. You cannot read a Tom Wright book glibly, even though his style is surprisingly readable. But this was, unusually for Wright, distinctly bland fare. I have been greatly stimulated by Wright’s work on kingdom and eschatology but was quite unimpressed by his work on the “Jesus meal”, as he often calls it. In all the other works of Wright which I have read, his writing seems to flow almost effortlessly out of his immense knowledge and learning of the Scriptures. This book is not like that, most of the arguments are from tradition or experience or common sense rather than from Scripture. And as a result they do not have that same “feel.” That same depth. That same stimulation to think or question. It probably did not help that I found his views on the “Jesus meal” overly mystical, a bit existential with just a touch more sacramentalism than I am comfortable with. He argues for communion in a church building, with ordained leaders, with due liturgy and seriousness. He does allow for different circumstances but he makes it clear that he thinks that these are the preferential means of holding communion. I guess I am just not high church enough. Perhaps naively I was surprised to find out just how high church and sacramental Wright could be. Some of my most meaningful times of remembering the death of Christ have been with a can of flat coke and a stale bread roll with neither ordained minister or church building in sight. Read everything else of Wright’s that you can lay your hands on… but feel free to give this one a skip! 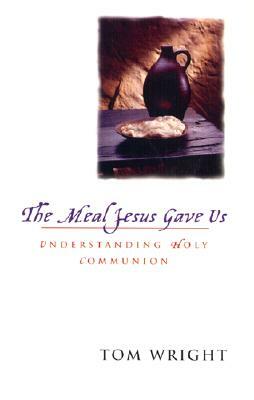 This entry was posted in Books and tagged Communion, Holy Communion, The Meal Jesus Gave Us, Tom Wright on July 26, 2013 by John.